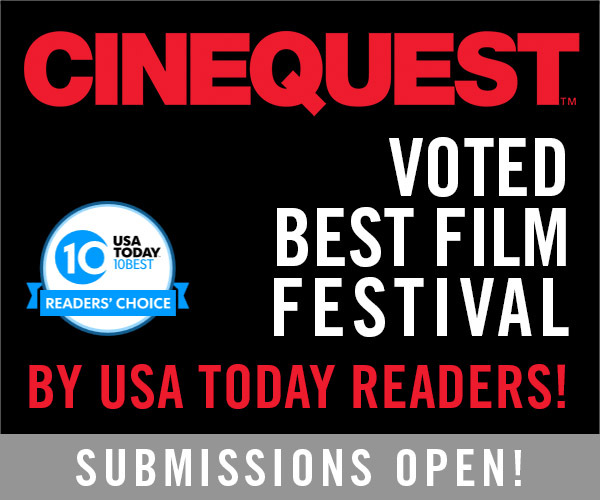 Cinequest, the world-renowned film festival that was voted “Best Film Festival” by USA Today Readers, is back for another year and is currently accepting entries for its 2016 edition, which takes place in San Jose, CA from February 23 to March 6. Filmmakers and screenwriters of all experience levels are encouraged to enter their Feature Films, Shorts, and Teleplays (accepting both 30 minute and 60 minute versions) into competition with up to $8,000 in cash prizes being awarded during the event. NYFA students from our Film School and Screenwriting School are encouraged to enter their work, especially since last year a student won the festival’s Shorts category. Those interested in entering can choose submit their script and/or teleplay by either by the Regular Deadline of September 25, the Late Deadline of October 16, or the Extended Late Deadline of November 6 (Withoutabox submissions only). Students interested in entering in the Cinequest Screenwriting Competition are encouraged to use the student promo code of STUDENT15 for a 15% discount on the entry fee. In addition, NYFA students have their own set of promo codes to use for a 50% discount on their film entry fee and are encouraged to use either “NYFAShort” or “NYFAFeature” for the Shorts and Feature Film categories, respectively. This year, the Feature Final Jury includes distinguished executives from Echo Lake Entertainment, Luber Roklin Entertainment, and Zero Gravity. Meanwhile, the Teleplay 60 minute final jury boasts executives and writers from PBS, FX, and more. Set in San Jose/Silicon Valley, Cinequest uses the tech backdrop that is home to such companies as Apple, Twitter, and Facebook to premier films, renowned and emerging artists, and breakthrough technology, encouraging global connectivity between creators, innovators, and audiences. Each year the festival presents over 90 World and U.S. premieres with groundbreaking innovations submitted by filmmakers from over 50 unique countries. With over 100,000 people slated to attend the festival, this is a great opportunity for students both to compete at a professional-level festival while being exposed to a wide variety of new work.